Donald Trump's sons, Donald Trump Jr. and Eric, are facing harsh criticism after photos from an African safari they went on last year surfaced. The photos showed the two posing with various animals they had hunted and killed, including an elephant. 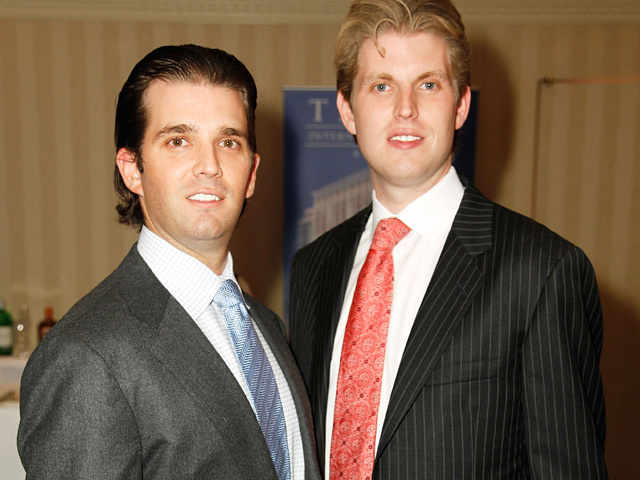 "If the young Trumps are looking for a thrill, perhaps they should consider skydiving, bungee jumping, or even following their anti-hunting father's footsteps and taking down competing businesses - not wild animals," animal rights group PETA said in a statement to E! News. So, what did Trump's sons have to say for themselves? "We have the utmost respect for nature and have always hunted in accordance with local laws and regulations. In addition, all meat was donated to local villagers who were incredibly grateful. We love traveling and being in the woods - at the end of the day, we are outdoorsmen at heart," they said in a joint statement to E!. The brothers went to Zimbabwe last year, and according to TMZ, they shot a variety of animals including, a crocodile, kudu, civet vat and water buck. One of the photos that surfaced shows Donald Trump Jr. holding the tail of an elephant and a knife as he stands next to the carcass of an elephant that has a rifle leaning against it. "Like all animals, elephants, buffalo, and crocodiles deserve better than to be killed and hacked apart for two young millionaires' grisly photo opportunity. If the Trumps want to help villagers, they have plenty of resources at their disposal," PETA continued in its statement to E!. Donald Trump Jr. took to Twitter to continue his argument. "btw I bet the money I spend on license fees that goes back to the animals is a lot more than the antis give for sure." The photos from their safari have since been uploaded into a Youtube video. Trophy hunting is legal in many African countries, but many conservationists believe the practice is responsible for diminishing populations of many threatened or endangered species.